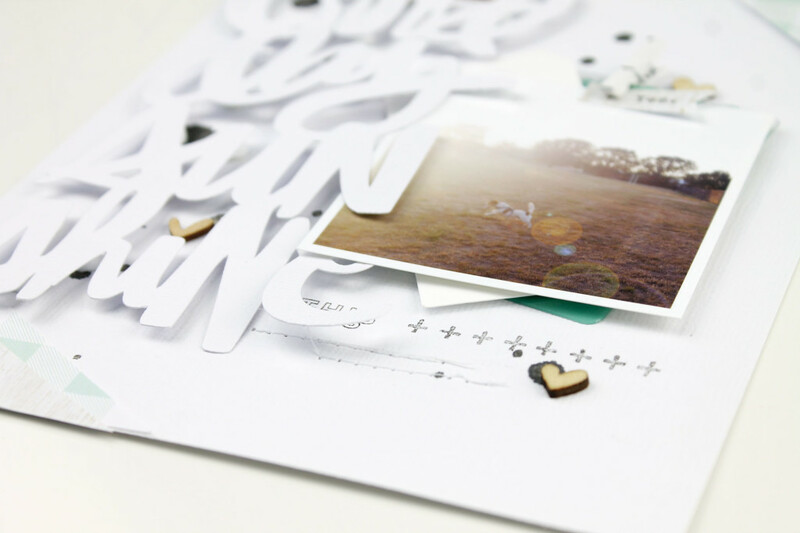 Ahhh…the big (inter) National Scrapbook Day has arrived! We’ve had an amazing week, yes? 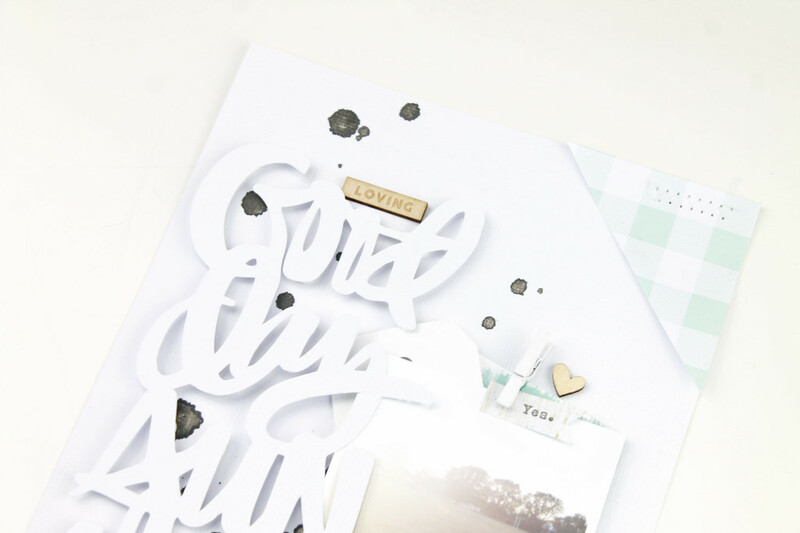 Got lots of ideas and designs and templates to get ya goin’ for today? I sure hope you’re ready for this day that celebrates the awesomeness of memory keeping! 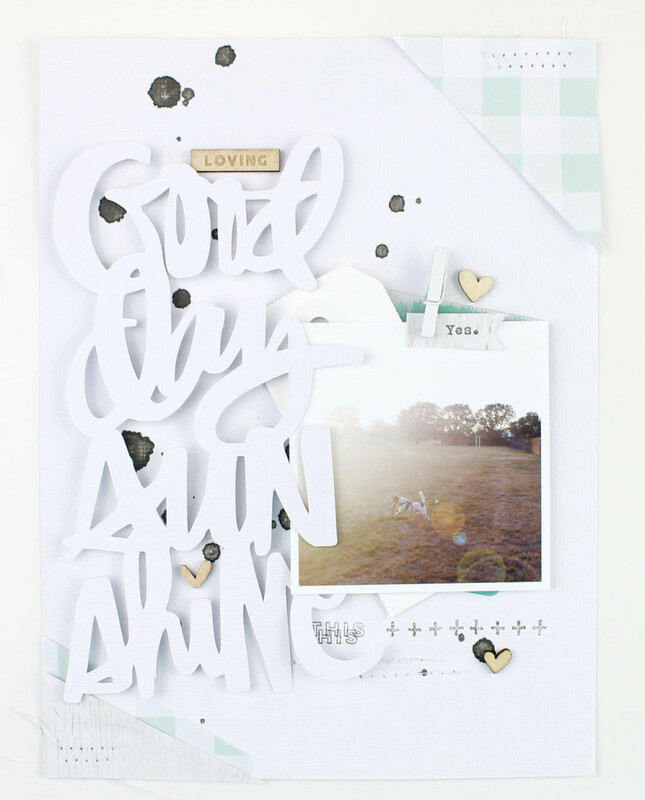 Today we have one last page to showcase–to get those ideas spinning–from our friend from down under….Miss Emma! Ohhhh, this girl is speakin’ my language! There’s nothing dreamier than white on white. Love how Emma popped the title up off the page too! It’s all just beautiful! My page is completely inspired by that gorgeous script title! It’s 100% the inspiration for this page and I had to search through the photo’s to find just the right one to match. This photo is on one of our walks with our dog, BJ, who is absolutely crazy for walks down at the football oval – he will run and run and run and then run some more, even if I stand still, he just runs around me in circles on the lead (like in this photo); crazy I tell you! For this page I wanted a much softer look than the bright pink I went with before so I settled on mint with a light woodgrain pattern (both Heidi Swapp papers). And although I’m a big fan of white on white, I added a few Color Shine splats in black to the background of my page so that the title would stand out more. I also added foam dots behind it so that it sits right off the page and I love the extra dimension they give the title; really helps it stand out (well I think so, haha). I believe I need to scraplift this one Miss Emma! Thanks for coming to our neck of the woods to play this week! And I also want to give a huge shout out to the KBS Creative Team. I am always in awe with everything they make and can never express enough how much I love them and their incredible talents. They are wonderful women that I have the privilege of calling friends.